(February 7, 2017) - The NOSA Sprint Cars are proud to announce the series will return to Jamestown Speedway in 2017. The event, scheduled for Saturday, June 10th, will mark the eighth appearance in series history at the high-banked quarter-mile facility located on the Stutsman County Fairgrounds in Jamestown, North Dakota. Austin Pierce collects fourth win in five races. GRAND FORKS & JAMESTOWN, ND (July 18-19) - Austin Pierce could not have been anymore perfect in main event action this weekend. Friday night, Pierce was scheduled to start eighth on the grid and was able to avoid a six car pile up on the opening lap, which put him outside of the second row for the ensuing restart. As the race went back to green, Pierce drove his way to the front and led the opening lap. Chris Shirek, who ran in second for the majority of the feature, was able to close in on Pierce while he was caught up in lapped traffic late in the race. 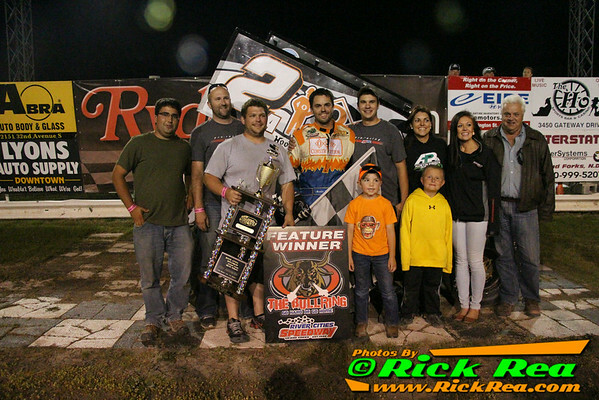 However, once Pierce was clear of traffic he took off and picked up his third consecutive River Cities Speedway win. Another double-header weekend line up for the Northern Outlaw Sprint Association. Jordan Graham lifts the front wheels off of turn two last Saturday night at Devils Lake Speedway. Photo by Mike Spieker. GRAND FORKS, ND (July 16) - The NOSA Outlaw Sprints have a double header weekend slated once again. Friday night at River Cities Speedway, the 410 Sprints will join the Wissota Modifieds and the World of Outlaw Late Model Series for a battle at the Bullring. Austin Pierce swept the double features last Friday and will try for his third consecutive win at the 3/10th mile dirt oval, but he'll have to top the always-tough Mark Dobmeier to do so. March 3 2014 - Northern Outlaw Sprint Association (NOSA) has updated their 2014 schedule. It now includes scheduled race dates for area Red River Valley tracks and River Cities Speedway in Grand Forks, ND. Area tracks NOSA will be competing at this year include: Buffalo River Race Park, Devils Lake Speedway, Greenbush Race Park, Red River Co-Op Speedway, Norman County Raceway and Jamestown Speedway. NOSA also frequently supports traveling sprint car circuits including the World of Outlaws and the All Star Circuit of Champions. NOSA will be supporting these area races in June, July and August of this year. Grand Forks ND August 16, 2013: Wade Nygaard and other NOSA drivers will be competing against the World of Outlaw Sprints tonight at River Cities Speedway in Grand Forks, ND. Nygaard comes into the night with some recent successes, including a win at Jamestown Speedway in late July and at River Cities on August 2nd. Most drivers have had their helmets hung up since the River Cities double features on August 2nd. A few NOSA drivers, Thomas Kennedy, Chris Shirek and Mark Dobmeier, competed in the 2013 Knoxville Nationals last week in Knoxville, IA. Frequent NOSA guest driver, Donny Schatz, won that event. While many sprint car fans, crews and even drivers flocked to Iowa for the Nationals, Nygaard and his family took the time to relax at the lake. However, they will be ready to race again tonight and Sunday in Minot, ND with the World of Outlaws. Nygaard has seen his success build on the track as the season has progressed this year. Nygaard hopes his team's success pays off again tonight while racing at his favorite track. Nygaard applauds the track conditions supplied by River Cities, but most importantly, he recognizes that Grand Forks' has the best race fans of anywhere. Nygaard credits his crew for the increase in the car's speed over the last few weeks and for their new found results consistency. "These guys are not paid employees, they are all good friends and family that love the sport of sprint car racing. We have a great time together even away from the track." Nygaard is hoping to stay up front for the remainder of the season. He is the current NOSA points leader, with only 6 NOSA points races remaining. Premium Waters, Northland Custom Woodworking, Bosh Enterprises, Halls Motorsports, Dahlstrom Motors, Valley Oral, Cash Trucking, Spring Valley Express, Eric and Betty Nygaard. Grand Forks ND July 9 2013: Dry and hot weather has lead to dry slick race tracks prone to laying rubber during the heat of the 2013 NOSA race season. But the tracks are not the only places NOSA driver's will be burning rubber; NOSA has a full travel schedule for the month of July at several tracks across the upper Midwest, putting many of the drivers and crews on the road. NOSA has had a strong car count at all of their in town and out of town races this year, with no less than 19 cars at any one race. NOSA has its regular Friday races scheduled throughout the month at River Cities Speedway in Grand Forks, ND. The group will also be hosting shows at Devils Lake Speedway (Crary, ND), Jamestown (ND) Speedway, Buffalo River Race Park (Glyndon, MN) and finally a double feature event night at River Cities Speedway on August 2nd.